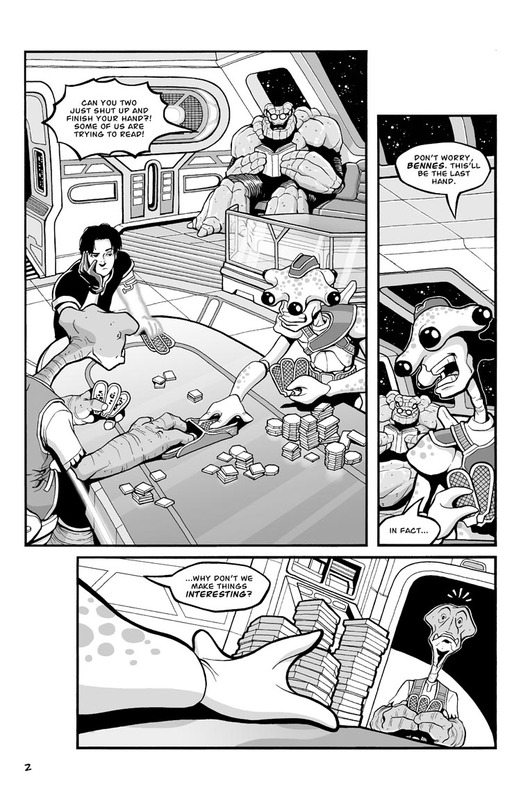 I toyed with making the game they’re playing something more alien and exotic, and I was concerned that a simple card game might be too Star Trek: The Next Generation, with that show’s recurring poker games. Ultimately, I decided the game only appeared in a couple panels, so my time was probably better spend concepting more important things. Heh. Or Mousetrap. That would have been a fun one to draw! I’ve always loved the red herring opening where the last page implys that they are about to fight a duel, but it just turns out to be some bluster in a game of cards. Very clever, Sean. Good job. Thanks! I’m still kinda proud of that opening fake-out.